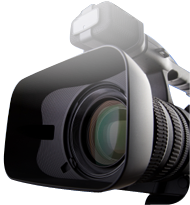 Will you be able to shoot video like the examples shown on this website right out the box? No, unless you have good previous experience with a handheld stabilizer. Like all handheld stabilizers the Blackbird requires operator skill and practice to achieve best results. Our instructional video includes tips to help you get started producing amazingly smooth shots. Why is skill and practice necessary to get good results with the Blackbird? Handheld with an 8 lb camera, are you kidding? The total Blackbird rig weight with an 8 lb. camera is about 12 lbs. Unless you work out at the gym daily you won’t be able to support this much weight for more than a few minutes. For most people cameras in the range up to about 6 lb (total rig weight about 9 lbs.) are manageable for longer times. Does the Blackbird have Dynamic Balance Adjustment? No. Dynamic balance (or pan axis balance) is the industry term for the behavior of the stabilizer when the camera is panned very rapidly, called a whip pan. A rig that is not dynamically balanced will tilt and/or roll when panned rapidly. The Blackbird chassis is designed for low dynamic imbalance and typically dynamic imbalance is acceptable. What is the return policy for the Blackbird? Products may be returned within 25 days of receipt for a refund of the purchase price. Original shipping charges are not included in the refund. Return shipping charges of up to $20 for purchase within the United States, or up to $75 for all international orders will be paid by CMR. Products must be returned shipping prepaid and with no damage to any parts. What is the Blackbird Warranty? The Blackbird has a full warranty for a period of one year for all defects in materials or workmanship. Warranty returns will be repaired or replaced at the discretion of CMR. The warranty does not include accidental damage from severe handling such as impacts, improper use or weather exposure. Call 919-876-6020 or email sales@camotionllc.com for warranty return authorization. Shipping charges will be paid by CMR at the lowest cost shipping method.